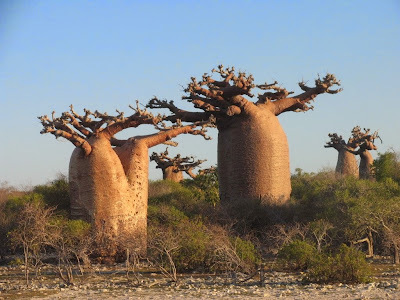 Baobab is the common name of a genus of trees (Adansonia). There are eight species. Six species live in Madagascar, one in mainland Africa, and one in Australia. 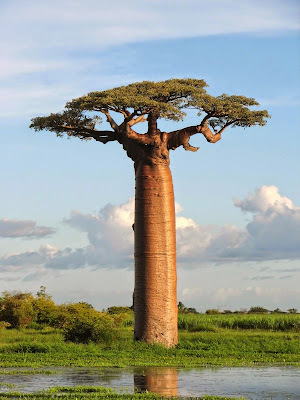 The baobab is the national tree of Madagascar. Other common names include 'boab', 'boaboa', 'bottle tree', 'the tree of life', 'upside-down tree', and 'monkey bread tree'. 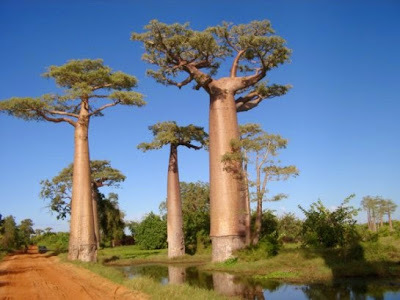 The trees reach heights of 5 to 30 metres (16 to 98 ft) and trunk diameters of 7 to 11 metres (23 to 36 ft). Its trunk can hold up to 120,000 litres of water. For most of the year, the tree is leafless, and looks very much like it has its roots sticking up in the air. The trees are long-lived, but just how long is disputed. The owners of Sunland Farm in Limpopo, South Africa have built a pub called "The Big Baobab Pub" inside the hollow trunk of the 22 metres (72 ft) high tree. The tree is 47 m (155 ft) in circumference, and is said to have been carbon dated at over 6,000 years old.